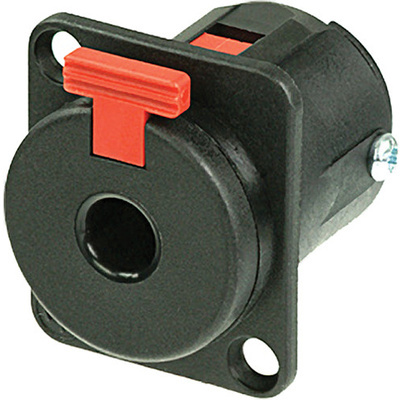 Product #21852 | SKU NJ3FP6C-B | 0.0 (no ratings yet) Thanks for your rating! The Neutrik NJ3FP6C-B Locking 1/4" 3-Pole Female Phone Jack (Panel Mount) provides stable and secure connections where accidental disconnect or shock and vibration may occur. It latches with standard A-gauge mono or stereo plugs. The plug locks in automatically when mating and unlocks only by pressing the red release tab.